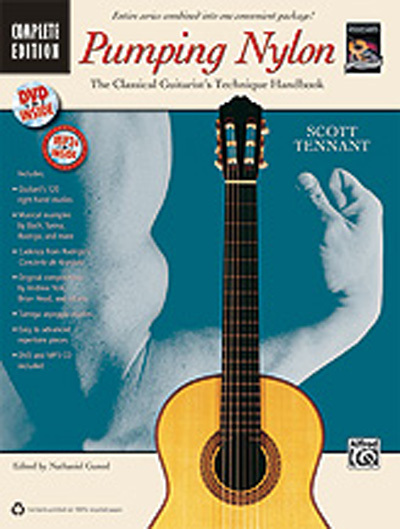 World-class classical guitarist and well-respected educator Scott Tennant presents the most comprehensive technique handbook available for classical guitarists. This complete edition combines all three volumes of Scott's best-selling Pumping Nylon series. In addition to technical information not available elsewhere, it includes classic etudes by Carcassi, Giuliani, Sor, and Tarrega; musical examples by Bach, Turina, and Rodrigo; and original compositions by Andrew York and Brian Head. Learn easy to advanced repertoire pieces that are selected and designed to work with the various techniques addressed, including arpeggios, tremolo, scale velocity, and more. The included DVD features Scott Tennant, and the MP3 CD features the playing of Scott Tennant and Adam dell Monte. Q: Is this model spiral bound? Which model do I get for spiral binding? This is just a regular paper bound publication. Not a spiral binding.